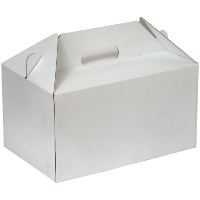 White cardboard carrier box with cut out handles. For wood ashes (single) casket. Shown with Warwick Superior ashes casket. Dimensions (inch): 8.5W x 13L x 7H. Dimensions (in cm): 21.5W x 33L x 18H.